You cannot browse the Internet in peace because you are constantly assaulted by annoying pop-ups? Perhaps you have recently installed Oh My Coupons on your computer, and so this adware program generates countless commercial advertisements when you browse the web. Aside from being terribly annoying, these pop-ups might also be associated with specific computer security threats. Therefore, it would be best to remove Oh My Coupons from your PC because adware programs quite often become tools of malware distribution, especially if they get exploited by cyber criminals. Before any of that happens, you should terminate all the unfamiliar programs in your system. At first glance, it would seem that it would not be much of a problem to download Oh My Coupons from its official website. Even our security researchers were able to access the website at first via ohmycoupons.com. However, after a few tests, the website would no longer load, so it is possible to assume that when users install Oh My Coupons, they do not download the program from the official homepage. That would not be much of a surprise because adware programs are more often distributed via third-party installers than through their official homepages. This clearly shows that Oh My Coupons comes in software packages that install other unwanted applications on your computer as well. The same distribution tactics have been employed by similar adware programs from the same family. Our research shows that Oh My Coupons is practically identical to Couponarific, Scorpion Saver, Savings Bull, Coupoon, and many other adware applications. The common aspect of these programs is that they come along with other freeware and adware applications, but they DO NOT slither into your system behind your back. Even if you do not understand that you install Oh My Coupons willingly, the program still informs you that it is about to be installed. Whether you notice the message on the installation wizard or not is entirely up to you. Technically, Oh My Coupons should help you locate the best discount offers on various online stores. There are many adware programs that promise to help you do that, but the problem is that almost none of them actually keep that promise. Oh My Coupons cannot help much either. Rather than providing you with reliable information, the program collects information on your web browsing habits and then makes use of that to display customized commercial offers. The commercial offers shown by Oh My Coupons are your biggest security concern. No one can guarantee that they are reliable or that they lead you to safe websites. That is why computer security experts always emphasize how important it is to delete Oh My Coupons and similar adware programs from your system. Just because the program itself is not malicious, it does not mean that you can simply ignore it. What’s more, you should seriously consider scanning your system with the SpyHunter free scanner to detect all the potential threats that might have arrived at your PC with Oh My Coupons. It never rains but it pours when it comes to uninvited cyber guests, so you should always be ready to fight them. The best way to protect your system from harm is to invest in a powerful antispyware application. Slide the mouse cursor to the bottom right of your desktop. 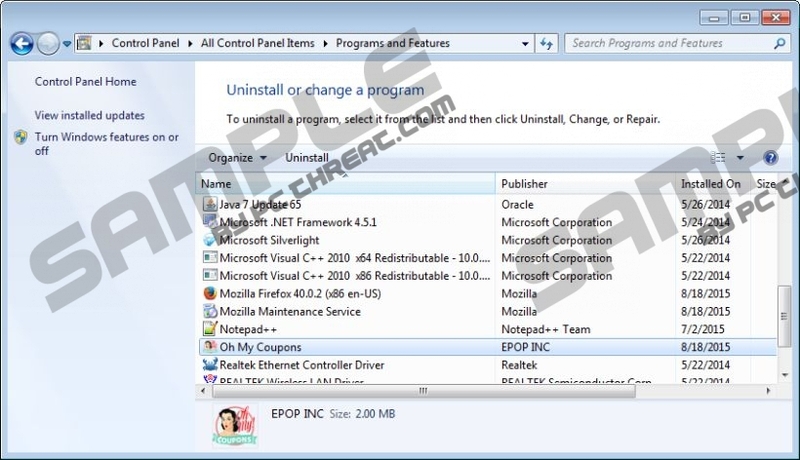 Select Uninstall a program and remove Oh My Coupons. Right-click the Windows start icon. Select Control Panel on the drop-down menu. Go to Uninstall a program and remove Oh My Coupons. Navigate to Uninstall a program and remove Oh My Coupons. Select Add or remove programs and uninstall Oh My Coupons. Quick & tested solution for Oh My Coupons removal.